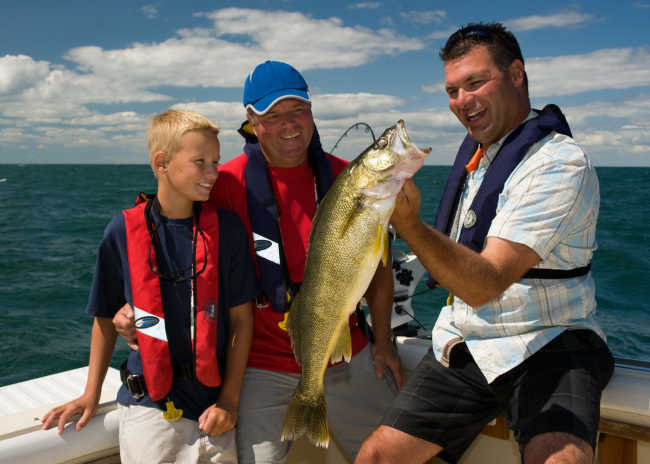 Lake Erie is the most productive fresh water lake in the world for pickerel, perch and rainbow trout.Visitors looking to taste the amazing difference of freshly caught and fried fish can partner up with a local fishing charter company for a Lake Erie expedition out of Erieau. Long Point Eco-Adventures also offers a variety of full service kayak fishing trips on Lake Erie’s Long Point Bay for first time fishers and seasoned anglers alike. Experienced guides will fillet your catch for you to take home or to local restaurant partners who will prepare it for you. What follows is blogger, Vicky Weiss&apos;s account of her Erieau fishing trip. I’ve just returned from an incredible stay in Erieau, Ontario. I don’t know about you, but I had no idea this charming town existed and I’m so glad that it’s now on my radar. For some reason I’ve been driving north on the 401 or east along the 401, but never west. Silly me! It’s so close to Toronto and there’s way less traffic. The highlight of the trip was a fishing excursion with J&P Charters. I’ve never been on a chartered fishing trip, but it’s always been on my bucket list. Lake Erie is known for its walleye and rainbow trout and that’s exactly what we caught. We had a perfect day. The sun was out, the water was calm and the fish were biting. 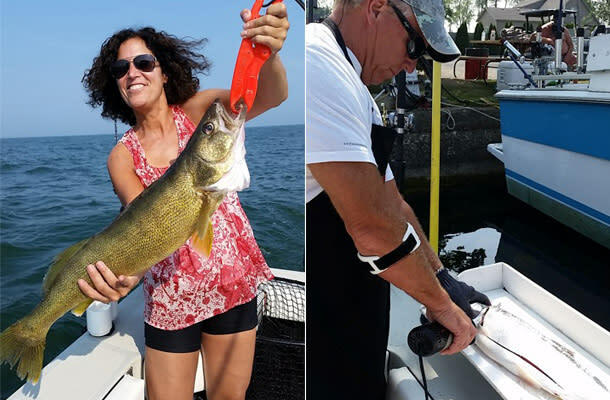 J&P Charters has everything you need for a Lake Erie fishing adventure: a well equipped boat, state of the art technology and 26 years of experience. Not to mention, Captain Paul will clean the fish you catch so you can take it home! (Which of course, we did.) You can also take it to nearby restaurant Molly and OJ&apos;s and they&apos;ll fry it up for you to eat right away. One great thing about this experience is that you don’t have to have any prior experience. They have excursions for amateurs and pros and people of all ages. I decided to leave the reeling up to the experts (Captain Paul and his son Tyler) while on the boat, however, they are more than happy to assist you and give you the guidance you need to reel in your catch. The choice is yours. With the help of Tyler, my fishing partner reeled in the biggest catch of the day– an eight-pound Walleye! Tyler was very helpful and walked him through the entire process of reeling it in. We got off the boat at 6:30 pm and by 8:30 pm we were perched at Molly and OJ’s Restaurant eating our catch of the day cooked up by the chef. Doesn’t get any fresher than that! Our dinner included soup, salad, dessert and the fresh fish that we had just caught for only $15 per person. INCREDIBLE! 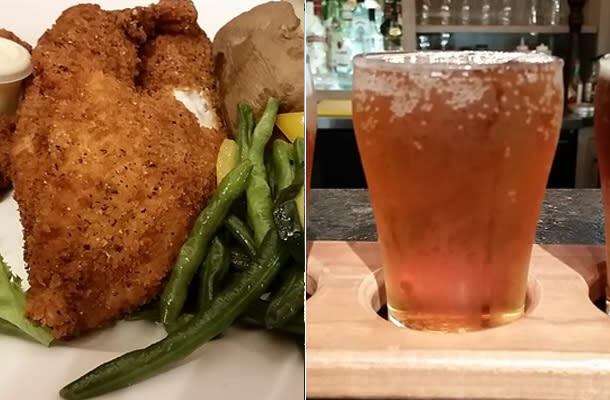 After dinner we relaxed at the Bayside Brewery and of course I had a flight of beer. They had a chocolate mint beer that was most interesting and I enjoyed it more than I thought I would. We stayed at Molly & OJ’s Lakeside Cabin Rentals in a very clean and fully furnished cabin that was located just steps away from their private beach. The beach had bicycles, paddleboards and kayaks for use, but I was content to just go for a swim and relax. For breakfast we went to The Galley Grill and Pub and we certainly enjoyed a unique breakfast that included eggs over easy, fried potatoes and cheese and several pieces of fried perch. I figured having fish with every meal was the right thing to do since Erieau is known for its fresh catch. Close by Erieau is Rondeau Provincial Park, an awesome campground that boasts one of Ontario’s best beaches. Sadly we didnt have time to go, but I’m already thinking about going camping there next year. It was a great experience and I can&apos;t wait to see more of what this close-to-home getaway destination has to offer. Vicky Weiss is a social media enthusiast with a passion for food and travel. You can catch her sharing her travel experiences and insider info on her blog Mom Who Runs and on Twitter and Instagram.